WHAT WERE THE PRIMARY REMODELING GOALS? their love of entertaining family and friends. Most of all, they wanted it to feel like theirs, while adding a bit more contemporary appeal to the design. ornamentation, and its material palette was dark and dated. HOW WERE THE SPACES ULTIMATELY TRANSFORMED? in an elegant faux-copper finish that is subtle and simple to clean. space, accompanied by comfortable couches and custom ikat linen curtains in citron for that added statement layer. In all the areas we designed, we made sure to make each area purposeful with the correct scale and amount of furniture, allowing the client to get the maximum use out of each space, whether it is a weeknight with the family or entertaining a crowd. Kayser: The new design speaks to the way the Jettons now use the space and reflects more of their personal style. We removed the bathtub and had a new, larger custom his-and-hers modern vanity built and fitted with an engineered stone countertop. We focused on storage and practicality. Everything has its place, including outlets in the recessed medicine cabinets. rectilinear faucets and streamlined cabinet hardware contrast the organic feel seen elsewhere in the space. The goal was to have a mix of elements that worked harmoniously together. WHAT VALUES HELP GUIDE YOUR DESIGN PRACTICE? values of implementing practical and functional design, along with keeping transparency in our processes. We work hard to build overall trust. We have the clients’ best interests in mind and always aim to create complete, beautiful spaces. Kayser: Designing a space for a client is truly about making their vision come to life. Our goal is to blend functionality and aesthetics. 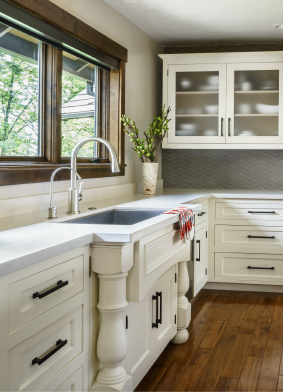 When the Jettons embarked on their master bathroom remodel, they had a lot of trust in our team based on our previous involvement in their home—they wanted us to think creatively and push them beyond the expected. Our studio is great at balancing all aspects of the client relationship and design project. Adriane Jetton, the homeowner, recently told Garrison Hullinger that she agrees. “You have cultivated a rare group of talented, consistent and genuinely nice people who listen and get things done,” she said. The Jetton family undertook two separate remodeling projects. In the first, in 2014, led by Alison Fedderson, senior designer, they redesigned their kitchen, dining area, living room, TV room and hallway. 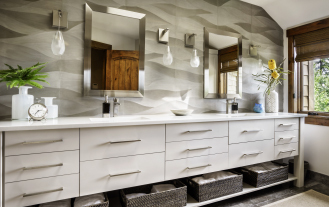 In the second, in 2015, led by Collin Kayser, senior designer, they overhauled the couple’s master bathroom. Design Firm, Garrison Hullinger >> عنوان البريد الإلكتروني هذا محمي من روبوتات السبام. يجب عليك تفعيل الجافاسكربت لرؤيته.